Picture: WCS match 2013 Norway-Belarus. Frogner stadium, Oslo, Norway. Bandy share venue with speed skating, figure skating, and the pastime skating public. The venue is used off-season by summer ball-sports football (FA) and American football. Frogner Stadium is the legacy home stadium of the figure skating star Sonia Henie and speed skating star, Oscar Mathisen. Oxford University suggests that the Winter Games sports related cost is about 60 % of the Summer Games. This translates to an athlete’s quota in the Winter Games of 6000. It is, however, capped at 2900. This is twice the price per capita compared to the Summer Games. The Winter Games need more sports for less cost. Bandy can provide this. Bandy share venues. 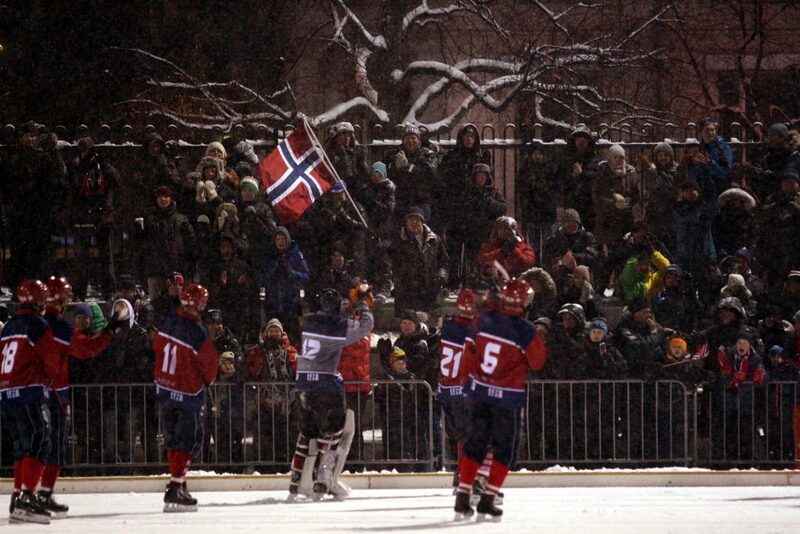 Bandy use existing venues. The Frogner stadium is an example of IOC policy New Norms. The most common venue in the World is the standard 100 x 60 meter rectangular. Adding artificial ice on the surface is affordable. Venue cost is no hindrance for bandy in The Games. The athletes’ quota is a poor measure of total cost and operating cost. In addition to the athletes and coach quotas, there are 25 000 beds for other staff. Bandy athletes’ will represent merely 1% of beds. Adding two bandy events will, in fact, reduce operational and investment cost per athlete and per event. The athletes’ quota has increased on average with 120 athletes on each of the 23 editions of the Games. The growth of 98 events and 2650 athletes has been allocated to the same sports (now IFs) that gathered in 1924. Bandy has no problem competing for 2 out of 109 events with a moderate quota. Hosting the Winter Games is the way governments support national and international winter sports. A significant share of state money intended for all sports is channeled through the Games. The cumulated expenditure sums up to USD hundreds of billions. Following the use of state money, all sports must have a fair chance to qualify as an Olympic Sport. Numbers from The Oxford Olympic study 2016 since 1993 reveal that taxpayers cover the lion share (80%) of the total cost. The IOC retrieves about 20% from consumers as customers of broadcasters and sponsors. The Olympics are a transfer system. The benefactors (taxpayers and consumers) transfer via an intermediary (the IOC) to the beneficiaries (sports). IOC shall fairly redistribute the money back to sports. IOC does so, but only to the 7 IFs on the programme. The state-aided and consumer-aided subsidy system is hard to defend unless there is a fair qualification process.